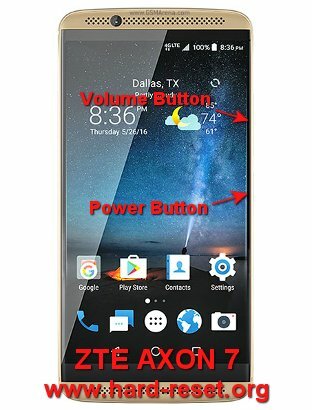 Tips and tricks to fix ZTE AXON 7 or AXON 2 (same product). This phone have 5.5 inches LCD screen width and can work with dual simcard slot. The screen use AMOLED type for better and vivid color for pictures and movies. The resolutions use qHD at 1440 x 2560 pixels. The www.hard-reset.org community will give more review information and solutions when this phone get problems. The ZTE AXON 7 will do the hard reset or master format to factory default process. How to Make Battery of ZTE AXON 7 / AXON 2 (A2017G) Stronger, Life Longer and Not Fast to Drain? With 5.5 inches LCD screen, having 3250 mAh battery capacity at ZTE AXON 7 will make this phone can work one day for standard usage. But if we are using ZTE AXON 7 for watch full movie or playing games for several hours then 3250 mAh battery will not enough. Therefore we have to do some adjustment like make LCD screen brightness as low as possible. This significantly can reduce battery usage and make it longer for work. The information from this page describe about reboot axon 7,zte axon reformat. If you need another resource for hard reset, use search function at this homepage or find from our related posts. How to Easily Master Format ACER LIQUID ZEST (PLUS) with Safety Hard Reset?